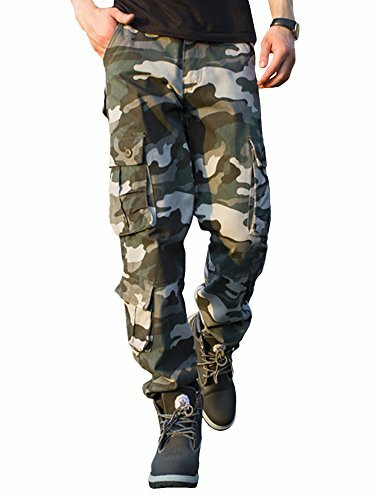 CloSoul Direct Men's Military Cargo Pants Loose Fit Wild Camo Hunting Combat Trousers Daily Basic Work Pants by CloSoul Direct at Average Adventures. Hurry! Limited time offer. Offer valid only while supplies last. WHY BUY THESE CARGO PANTS? WHY BUY THESE CARGO PANTS? 29W / TAG 30 - Length: 42.5" / Waist: 29.9" / Hip: 37.0" / Thigh: 19.7"
30W / TAG 32 - Length: 43.0" / Waist: 30.7" / Hip: 37.4" / Thigh: 20.5"
31W / TAG 34 - Length: 43.5" / Waist: 31.5" / Hip: 37.8" / Thigh: 21.3"
34W / TAG 36 - Length: 44.0" / Waist: 34.6" / Hip: 39.4" / Thigh: 22.8"
35W / TAG 38 - Length: 44.5" / Waist: 35.4" / Hip: 40.9" / Thigh: 23.6"
37W / TAG 40 - Length: 45.0" / Waist: 37.0" / Hip: 42.5" / Thigh: 25.2"
38W / TAG 42 - Length: 45.5" / Waist: 38.3" / Hip: 44.0" / Thigh: 26.9"
Please contact us if you have any question about the pants, we will be happy to solve it for you! Mid waist / Loose fit / Straight leg / No stretch / Zipper closure / Quick dry / Moisture wicking farbic / Mechine wash below 30degree. If you have any questions about this product by CloSoul Direct, contact us by completing and submitting the form below. If you are looking for a specif part number, please include it with your message.